Providing extra warmth on cold mornings or covering up so you can do some errands before heading home, the Brooks Distance Women's Long Sleeve Tee is the perfect companion for runners or anyone looking for a high-performance top that can do it all. 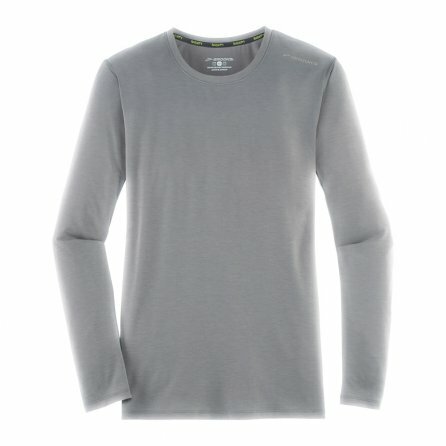 Made from moisture wicking DriLayer® synthetic, this shirt will keep you dry and comfortable on runs in the toughest weather, and the Burst treatment applied to the fabric also helps it resist odor so it always feels fresh every time you wear it. The spandex woven in gives it a touch of stretch for easy movement, and there is a relaxed fit so you can easily layer over other workout gear. I like these shirts so much I bought three. They wash well, too! I love this shirt. The fabric is light and stretchy and it does not get hot in the full sun. I bought a large so that it would not be snug. Fits great.